Available from Sheetmetal Tooling Tech , Wilson Tool’s V-Series for press brake dies incorporates rotating inserts to decrease friction and to enable better performance on certain tough-to-bend applications. Manufactured by Rolla-V, the Wilson V-Series is available for virtually all major styles of press brake tooling. Wilson V-Series press brake dies available from Sheetmetal Tooling Tech, make it easier to produce small flanges, small bend radii, and bends closer to holes. 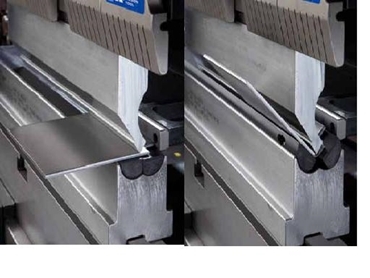 The Wilson V-Series also enables the user to bend a wide range of materials using the same die, reducing set-up time and reducing the amount of tooling required. The rotating blades on Wilson V-Series are available in either metal or composite material. Metal blades are the most durable, while composite blades are used when minimizing sheet marking is essential. These blades are interchangeable within the same die base. Wilson V-Series press brake dies available from Sheetmetal Tooling Tech, include built-in blades that rotate so there is minimal lateral movement between the sheet and the die. This reduction in movement decreases the friction between the die and the sheet which helps to minimize sheet marking.